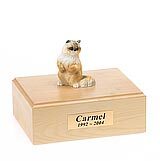 "I recently ordered an urn for my beloved pet from your company. I wanted to take a moment to say Thank You for the wonderful job. This would be from the time I placed my order right up until today when I received another email from you, making sure I received my order. It was very much appreciated that you took the extra time to be sure everything was ok. I have been very upset with my loss and you have helped me, knowing my pet has a special place to rest now. I appreciate the card of condolences also. I will remember you and your company if ever anyone I come in contact with needs your services. " 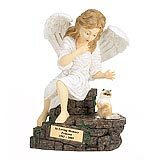 All available Ragdoll cat urns and memorials will be displayed with the figurine on the Ragdoll urn you select and in the appropriate size.